Who is really responsible for maintenance? You call your maintenance team when something big breaks at work. But how do they get the message? What is the process between “Hey that machine is making a weird noise” and “We need to get maintenance down here ASAP”? The maintenance team can’t be everywhere at once, biding their time until something breaks down. Which raises the question: Who is really responsible for spotting those small fixes and improvements that make your facility run better? The short answer is everybody. 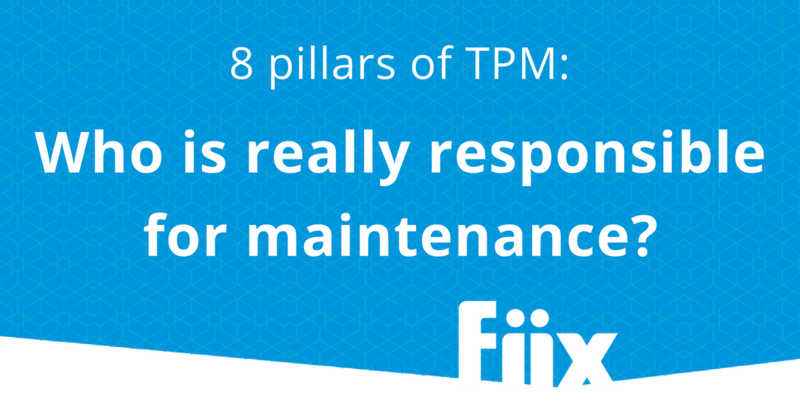 This idea that everyone should have a hand in maintenance is called total productive maintenance or TPM. TPM focuses on the idea that getting the entire workforce involved in maintaining equipment and emphasizing proactive and preventive maintenance will eventually lead to fewer breakdowns, a safer workplace, and better overall performance. The first step towards TPM is making sure everyone has access to your computerized maintenance management system (CMMS). You might only have five people on your maintenance team, but everyone—from machine operators to reliability engineers—should be able to see the information stored in your maintenance management software and log information of their own. Plant managers, line supervisors, and machine operators work with the equipment day in and day out, and they know what’s normal and what’s not. A TPM approach gives operators the primary responsibility for taking care of their equipment, including cleaning, inspection, and basic maintenance. Gives operators greater ownership of equipment. Increases their knowledge of their equipment. Ensures equipment is well cleaned and lubricated. Identifies issues before they become failures. Giving everyone in operations access to the CMMS lets them see the status of machines, create to-do lists and daily PMs, and clear trivial issues so the maintenance team doesn’t have to deal with it. The software also helps ensure that operators—who may not have the same technical training as maintenance personnel—follow the correct procedure every time, with features like task groups and checklists. Your tool crib operators and inventory managers need an easy way to keep track of rotating inventory and assets. There’s no need to overcomplicate things by implementing an often costly tracking system just for inventory—most CMMS software solutions come ready-made with an inventory management or rotating assets feature. By including this information in your CMMS, everyone has a good picture of the tools and parts available and where to find them. One of the key pillars of TPM is health and safety and eliminating safety risks in the workplace. A CMMS supports this function by letting you keep track of the whereabouts and condition of safety equipment, as well as inspection rounds. One of the knock-on effects of all these people inputting information in the CMMS is that you end up with a lot of data. Reliability engineers can crunch this data and make sense of the maintenance metrics, ultimately turning all the information you entered into actionable business insights. By including a bigger breadth of information from a range of departments, you get a more in-depth view of your business. 1. If you make maintenance a shared responsibility across the organization, it relieves some of the pressure on your maintenance department and frees up their time for the larger, skilled jobs. 2. Using your CMMS to capture information from all corners of your business gives you a complete view of your facility, which helps improve efficiency and productivity across the organization.